If you are looking for someone you can trust to fix your plumbing problems and someone you can rely to get inside your house, then you can count on BS Plumbing Services to be reliable and professional. We can help you to resolve your plumbing issue promptly and effectively. All of our work is done to the highest standards of workmanship and all repair service are completely guaranteed, it is our commitment to make sure we have a completely satisfied customer who feel confident in using our service. We offer a full range of plumbing services from small emergency repairs on leaks and blockages to complex commercial and industrial plumbing issues; every job we do is carried out to the same high standard of quality and care. Need a new water heater or just looking to increase the operating efficiency of your current one? We can supply and install electric storage water heaters or instant water heaters for your home or business. Our priority is to install the best type of water heater for your needs. Our professional plumbing technicians are experienced and well trained at electric heater installation. No matter what type of water heater you need our expert licensed plumbers always do a professional job. Whether it be a new installation, an upgrade or replace to your existing water heater, call us anytime, we can handle it. We will haul away and dispose of your old water heater as part of our service. Is your bath or shower slow to drain? Toilet filling up when you flush it? We have all the tools and equipment to clear all blockages. Our plumbers can clear blockages using an electro-mechanical or high-pressure water jetter. Sewer blockages are not a problem for our plumbers. They are all fully trained, so you can feel safe in the knowledge that they won’t just do the job well, they’ll treat you and your home with respect too. Unlike some unregistered bogus companies, we are ACRA registered. It is important for consumers to feel assured that they receive Honest, Trustworthy and Reliable Service. At our company, you can be assured. When choosing your plumbing service provider, the reliability of a plumbing company should be your primary concern. If it is found that a business never existed, you are advised to take extreme caution. Keep in mind that the disclosure of the real business ownership is for consumer protection. Proof of Payment and Transaction - An official receipt/invoice will be issued on the spot by BS Plumbing Services for every payment made by customers. The receipt/invoice indicate the total amount paid with a detailed breakdown of what the payment is for, and it bears the company full details such as company’s name, register no. and address. 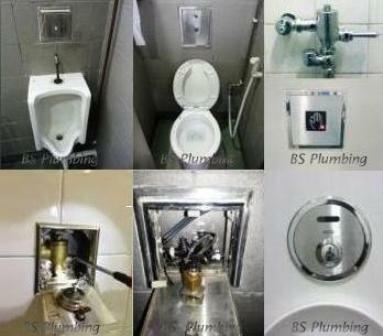 Our team of local Singaporean licensed plumbers consists of experienced, highly skilled individuals committed to providing a service of supreme quality. They will explain exactly the work is being carried out, why it is necessary and the prices cost will be. We aim to ensure that the work is completed on time and to your satisfaction. Allows customer to know the final cost of work before the job is started, without the worry of any hidden charges. We will always carefully evaluate your situation and will provide you with an exact price you approve of before any work begins. To ensure your utmost confidence, BS Plumbing Services provides 3 months labour warranty on all plumbing repair and installation services. If a repair/item fails during warranty period, we will come back and fix it again absolutely Free, to give you peace of mind. (Please keep your receipt for verification) Warranty for products such as water heater is limited to the manufacturer’s warranty. With 24 Hour Emergency Service, you can depend on receiving high quality service anytime. We’re available 24/7/365! You can schedule appointments at anytime and you can count on BS Plumbing Services to be prompt, courteous and professional. As a professional 24 hours plumbing services provider we realise that your time is valuable. As such we take great effort to ensure that our service vehicles are always fully stocked with most commonly used parts so that we can ensure that all work wherever possible is completed quickly and on our first visit. Residential, Commercial, Property Management/Strata - All Welcome!